"The only thriving part about Micra is its sparky diesel engine and spot-on Japanese framework, apart from that Ignis is one of the best offering in terms of drive-ability as well as attributes"
The top of the line petrol 'XV CVT' variant of Micra retails for 7.48 Lakh Rs. on-road Delhi which is about 9,000 Rs. costlier than top end petrol 'Alpha' of the Ignis that retails for 7.39 Lakh Rs. on-road Delhi and about 52,000 Rs. expensive than 'Zeta AT' petrol of Ignis. The 'XL (O)' variant of the Micra powered by diesel engine will cost you about 8.06 Lakh Rs. on-road Delhi while the 'Alpha' variant of Ignis quotes a price tag of 8.75 Lakh Rs. on-road Delhi and its 'Zeta MT' is priced at 7.75 Lakh Rs. on-road Delhi. However, the Ignis Alpha comes with much modern and convenient features over Micra like Parking Sensors and Camera, Split rear seat, DRLs with Projector Headlamps, Touchscreen infotainment system which indeed are very useful and handy features while both of these cars have basic safety features like ABS, EBD and Airbags as standard across all variants. Airbags, ABS, EBD, Child Seat Anchor Points, Engine Immobilizer, Central locking, Automatic Climate Control, 12V Power Outlet, Steering Adjustment, Push Button Start/Stop, Height Adjustment for Drivers Seat, Power Windows at front and rear, Power Steering,Electrically Adjustable and Retractable ORVMs, Rear Defogger, Rear Wiper, Average fuel consumption, Average Speed, Distance to Empty, Integrated Music System, Aux, Bluetooth, FM, CD, Steering Mounted Controls, Adjustable Headrests. Child Seat Anchor Points, Speed Sensing Door Lock, Rear Parking Camera and Sensors, 60:40 Split Rear Seat, Turn Indicators on ORVMs, USB, Projector Headlamps with DRLs, Fog Lamps, Touchscreen Infotainment System. Brake Assist, Anti-Glare Mirrors, Rear Armrest, Follow me Home Headlamps, LED Tail-lamps. The Nissan Micra comes powered by a 1.2-liter three cylinder petrol engine, capable to churn out 76 bhp of power and 104 Nm of torque while Ignis gets a 1.2-liter four-cylinder producing greater output of 82 bhp and 104 Nm torque. Micra's engine does not have the same serenity as the Ignis's K-series motor due to absence of an extra cylinder, but shows disposed performance and pickups at varying power-bands. If driven back to back, one will certainly choose the Ignis petrol over the Micra as the k-series unit in the Maruti responds much lively and its effortless power outputs would surely put a smile on your face no matter if its city or stretched highways with enhanced NVH levels inside the Cabin. On paper the CVT transmission on the Micra ensures committed performance but in real world conditions the CVT feels quite lazy to respond and doesn't offer you the same zest delivered by the AMT as well as the manual of the Ignis. The performance of the diesel motor on both of these cars is evenly complemented. Though Micra comprehend a bigger engine of 1.5-liter in terms of displacement when compared to 1.3-liter DDiS of Maruti but the Ignis manages to cope up by yielding greater power and torque figures than the Micra and all these power fluctuations does not affect the performance in both of these cars. One advantage of Ignis is that its available in both automatic and manual transmission even in diesel version but Micra only have manual gearbox in its diesel counterpart, but the performance is surely up to the mark for the car in this segment. The petrol variant of Micra equipped with CVT Transmission delivers an ARAI certified mileage of 19.34 kmpl which is about 1.5 kmpl less than Petrol Automatic as well as Manual transmission of Ignis having an ARAI claimed mileage of 20.89 kmpl. While the diesel unit of Micra holds an ARAI certified mileage figure of 23.08 kmpl and comes only with a manual transmission while the Ignis Automatic and manual both have an ARAI certified mileage of 26.8 kmpl making it about 3.72 kmpl more efficient than the Micra. In real world conditions, both transmissions of Ignis petrol were 2 kmpl more fuel efficient than Micra petrol and diesel Ignis was about 4 kmpl more efficient than Micra diesel. Micra is marginally larger in length than the Ignis which makes it roomy enough for tall passengers at the rear seat by offering more amount of knee room. Seating three average sized occupants at the rear is much comfortable in Ignis due to the efficient use of its width and the tall boy stance lends ample head room at the rear while tall passengers in Micra might complain about their head touching the roof during certain undulations under bouncy conditions on bad roads. Also the bulging out of AC knob from Dash on the Micra crashes with the left knee of driver if the seat is adjusted a bit forward. The glass area in both these cars lends extreme sense of airiness inside the cabin. The cushioning of seat in Micra is far superior than that of Ignis and aren't heavily bolstered. It offers generous amount of under back support. Ignis too offers plush seats but lack in under thigh support which could be tiresome during long day spent in Car which isn't the case with Micra. Ignis gets a fuel tank of 32 liter while Micra has a big 41 liters of tank capacity but it offers a little less boot space than Ignis. Both Micra and Ignis have McPherson strut suspensions at the front and Torsion Beam setup at the rear which are able to absorb most of the shocks easily. Micra's suspension are tuned a bit softer making it wobbly and bouncy under high speeds although there aren't any noticeable jerks at city speeds. On other hand, the Ignis conquers most of the broken patches with ease by its sturdy suspension setup and higher ground clearance makes it even more likable under bad road conditions. Ignis's low weight and shorter wheelbase revamp its agility and further enhance its on-road grip. On normal curves the Ignis suffers a little body roll, but on straight highways the stability is imposing with outright feedback from the steering. Short turning radius on the Micra is complemented by serene steering makes it cushy around the town but on a freeway the steering doesn't weight up thus resulting in wretched stability which is brilliantly tackled by its pliant chassis by retaining decent control of its body movements as the speed rises. The trust that Maruti Suzuki has earned in India is incredible. People believe in the quality offered by Maruti Suzuki and the unmatched service provided by them. Nissan obviously is a great brand since years when it comes to reliability and the same is reflected by their legendary GTR which is still loved by the people all over the World but isn't established as Maruti Suzuki. Maruti has the largest spread network in the country and is continuously serving its customers with immense dedication while Nissan is way behind in reaching the enthusiastic buyers and thus have limited amount of dealerships and service centers across the country which needs huge expansion ahead. Nothing can beat a Maruti Suzuki car for its maintenance, cost of service, repair and higher resale value, thus making it the most coherent choice in terms of cost of ownership. Micra turns out to be an appropriate car for hassle free drives in the city but its CVT gearbox doesn't really manages to impress an automatic enthusiast due to lack of vividness and its lazy response might be troublesome during quick overtakes on the Highways. Though the diesel unit of Micra with manual transmission certainly feels better than the petrol CVT, thus rendering spirited drive-ability, feels excited to respond and possesses elegant ride quality and can be surely picked as an option. While things goes well & good for Micra until Ignis comes into action and play its vital part by putting an extraordinary list of characteristics and performance it has on offer. Firstly it seals the deal by giving you an option of both Manual as well as Automatic transmission in petrol and diesel variants which isn't the story with Micra. Secondly, the Ignis will definitely arouse up the ambitious driver in you by its delightful performance and tons of unique features for the millennials. 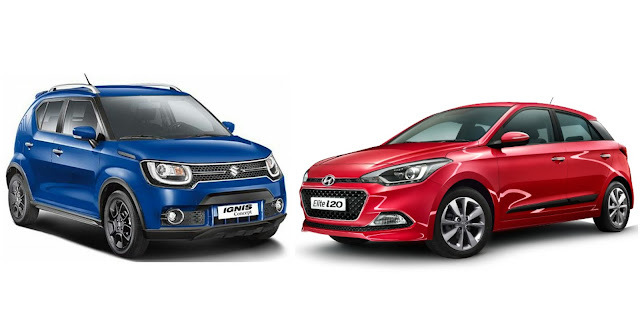 The icing on the cake being its extensive price range aimed to suit the budget of every passionate car buyer with the certainty and dedicated after sales support which is now a Complementary part on behalf of Maruti Suzuki to its loyal customers.